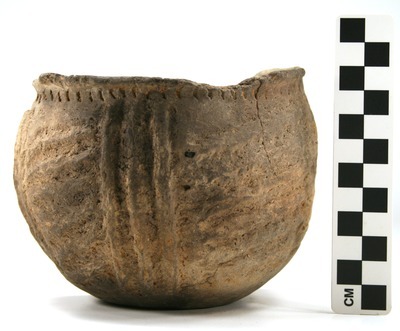 "Vessel 41, Burial 8, 2003.08.1288" by Timothy K. Perttula and Robert Z. Selden Jr.
DECORATION (INCLUDING MOTIF AND ELEMENTS WHEN APPARENT): The rim has a single row of tool punctations below the vessel lip. The body is divided into panels by four sets of three vertical pinched rows that extend from the vessel base to the rim-body juncture. The panels themselves are filled diagonal to horizontal pinched rows. Killough Pinched jar, Vessel 41, Burial 8.